Azeb Adefrsew Consultancy is a firm that achieved talent and dynamism within its seven years of existence as a result of benefiting extensively from over 35 years of rich experience of its founder. The Consultancy has built a strong professional team that combines diversified technical skills and experience in child protection, education, gender and social development which are bringing a range of different perspectives to the services it renders. Our areas of expertise include carrying out participatory research and surveys; final, mid-term and post-evaluation of programs and projects; documentation of good practices and impact assessments; manual development and training; as well as rights based programming, mapping and capacity assessment. 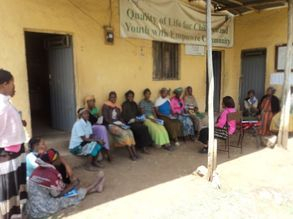 We provide short-term and long-term consultancy services across a range of technical areas that include child protection, child rights, child participation, positive disciplining and parenting, livelihood, gender equality, psychological support and empowerment of vulnerable children, youth and families, especially children with disabilities and those affected and infected by HIV/AIDS. We operate across Ethiopia and have gained some experience within the African Region. 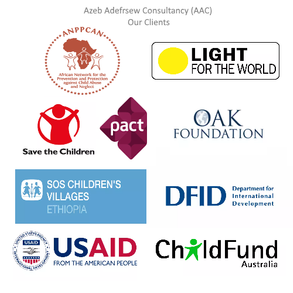 We worked with many international and local NGO clients and major donors: including, SOS Children's Villages Ethiopia, Save the Children, Light for the World, Pact, DFID, ChildFund, OAK Foundation, USAID, SIDA, Regional Psychosocial Support Initiative (REPSSI), Retrak International and Population Services International Ethiopia (PSI/Ethiopia). We perform our tasks in accordance with professional standards and to the satisfaction of our clients. Our research and evaluation expertise is wide-ranging and we deliver assignment using appropriate methodologies, frameworks and data collection tools. Our firm has carried out extensive work in different regions of Ethiopia. Quite a number of assignments were carried out in Addis Ababa, Amhara and Southern Nations, Nationalities and Peoples Republic (SNNPR) and Oromia regions and thus we are very familiar with the social and cultural realities in these areas. 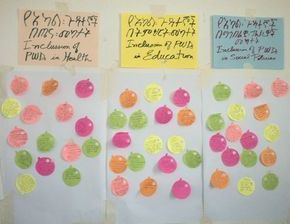 The firm has also carried out some assignments in Afar, Gambella, and Somali regions.